I have long loved the nutty flavor of brown rice but preferred the firm unexploded texture of white. I suspected/hoped that if cooked correctly, the texture of brown rice could approach that of white. (I never expected it could rival it!) This has led me to a many month-long exploration of different cooking methods and in the process I have actually seduced/converted a passionately resistant Chinese devotée of white rice--our very own Hector Wong. I promised him brown rice "like pearls with each grain exquisitely separate." How could he resist trying? Here was his immediate response: "It is really pearly heaven, each kernel pops between my teeth like popcorn, so fun. I love brown rice NOW, you have converted me. It is like having fried rice but sans all the frying oil and soy sauce!" Before posting the method we wanted to make sure it would work in all types of rice cookers. We both went through pounds of brown rice trying every variable we could think of, verifying that indeed it is the case that different rice cookers produce different results. Not to worry--it's mostly a question of adjusting the amount of water to suit your taste. My basic proportions to serve two as a side dish are: ½ cup/90 to 100 grams/3.2 to 3.5 ounces short or medium brown rice (Nishiki or Kokohu brand are what I use): a scant ½ teaspoon salt or to taste: 2/3 cup water/156 grams/5.5 ounces. (If you use less you will need proportionately a little more water.) In my little yellow Zo Rizo NS-XBC05 which does not have a brown rice setting (though it has other useful settings (see below) I needed double the water (1 1/3 cups/312 grams/10 ounces) and the rice cooked in 1 hour and 10 minutes with very similar results. I observed that on both Zos, the first 20 minutes or so of the cooking cycle is just soaking (no heat). These short soaking periods are ideal to my taste, making the texture most perfectly firm and unexploded. Additional presoaking before starting the cooker had no benefit and in the Rizo it caused the rice to burst slightly! I like my rice every so slightly crunchy (but if you were to cut a cooked grain in half there would be no chalky white exterior). If you want it softer and more tender you have merely to adjust the water amount to your taste. I love the Zos and would recommend them to everyone who loves rice, but for those who already have a "simple" rice cooker and want to use it http://en.wikipedia.org/wiki/Rice_cooker Hector has tested my recipe with comparable results using triple the amount of water 2 cups/472 grams/16.6 ounces and no presoaking. Cooking time is 1 hour and 10 minutes. (The cooking time in the simple cooker is 1 hour 45 minutes (it shuts off at around 45 minutes and then he lets it sit for 1 extra hour). We both like to add about 1 teaspoon of oil for the above amount of rice (sesame or vegetable oil) to coat the grains and keep them all the more shiny and separate. 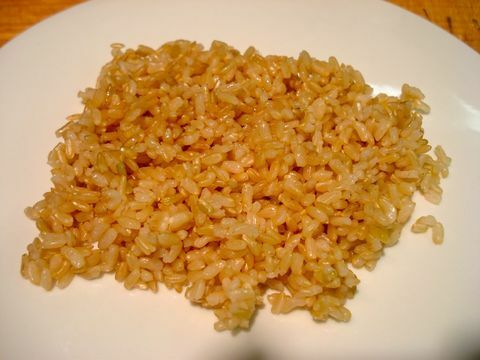 Always wash the brown rice in 3 changes of cold water and drain well before cooking. If you added more water than I do and the rice seems moist, you are not serving it right away after cooking, and want to keep it on the warm setting, first fluff the rice lightly, then cover the container with a paper towel before closing the lid to absorb any condensation. If you are thinking of getting a rice cooker and are undecided which model, I would recommend either of the two Zos mentioned above. They are small enough to make rice for one and large enough to make rice for four. As to which one: See below where I describe making risotto in the Rizo! Note: A while back Hector gave me an idea for cooking Chinese sausage and rice which he calls his comfort food. So this is the brown rice version I was inspired to make and here's how I sent it back to Hector to inspire him to try brown rice! 3 Chinese sausages, sliced about 1/2 inch thick on diagonal (or 3 tsp olive oil). optional: cilantro, scallions, bean sprouts. I add them after rice is cooked and then let them sit on keep rice warm setting for about 10 minutes. 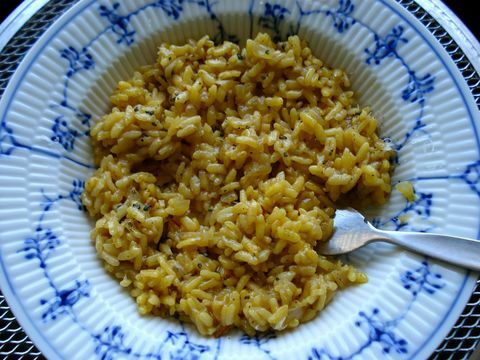 If you're a traditionalist you may not agree with me because, as you can see, though this risotto has a deliciously creamy texture, it is not soupy the way most risotto served in restaurants tends to be. Of course you can adjust the water to make it the consistency you desire. My little yellow Zojirushi Rizo NS-XBC05 has a risotto setting so of course I had to try it. I used the recipe in the booklet that came with the rice cooker. You can't go wrong if you use the little measuring cup that comes with it as well but if you want to alter the amount, know that the measuring cup is not a US 1.5 cups (12 fluid ounces/24 tablespoons), it is 9 fluid ounces/18 tablespoons. The recipe involves cooking the onion on the stove top, stirring in the rice to coat it, and then cooking it with the wine, broth, and saffron for about 20 minutes. Then adding salt, butter, and Parmesan. This needs to be served immediately. Fabulous!